Congratulations to Pat, Esther, and Beverly! “Flight 117 touched down at London Heathrow Airport just two weeks after Connie’s graduation. Marni had insisted on proper celebration with friends and family, and her most important clientele at the gallery. She wasn’t pleased with Connie’s decision to gallivant across the globe with Cassie, but she was sure that after a few weeks of living fancy free, Connie would return to a life of order and protocol. A proper life. The life Marni had mapped out for her. She didn’t know the true Connie, the party girl, the life of the party, the grab-life-by-the-horns persona. She was the wild child that Marni insisted on accusing Cassie of being. Cassie stretched and opened her eyes to bright sunlight streaming in the room. This was not Christmas as usual, at least not for her. She shrugged into her terry wrap, the one she wore over her bathing suit, and headed down the stairs. Alyssa poured, and Cassie added her creamer, and the two of them stepped out on the veranda of the Queenslander style home. On the beach, outside the city and down the coast near Thornlands. “This is amazing!” Cassie gazed out over the ocean panorama. Alyssa was nonplussed; to her it was an ordinary Christmas morning. Her brother and his wife were driving up from Sydney, and their parents were flying in from Melbourne later in the afternoon. Cassie nodded and finished her coffee. She turned to go back in the house. “We’re pretty isolated out here.” And Alyssa was in the waves. Cassie was still hesitating when Connie stepped out on the deck and stretched. “Ohhh, skinny dipping,” she squealed and stripped off her teddy sleeper. Cassie sighed a deep breath, expelled it. Gingerly she draped her cover-up on the arm of the chair, slipped out of her sleep shorts and cami-tank. Isolated or not, she felt fully exposed. But the water was warm, and the waves active, and it was just the three of them for the better part of an hour. “Anybody hungry?” Alyssa was running toward the house, Connie right behind her. “I could go for some breakfast,” Connie called after her. Cassie muffled something affirmative, and stalled until the other two were stepping through the door of the house before she emerged from the water. She made a quick dash for the steps that led up to the tall veranda, and shrugged her cover up around her before scooting inside to change into some proper clothes. In the kitchen she found Alyssa in a strappy sun dress, and her sister with a button up shirt, unbuttoned, and nothing else. Near to the same age, Alyssa and Connie were steeped in conversation comparing life in Brisbane and life in New York City. Cassie slipped upstairs to take a cool shower; the humidity was already climbing. They lunched on watermelon and cold turkey sandwiches, from the comfort of the air conditioned kitchen. Not thinking it Christmas, in spite of knowing fully well the date, Cassie was ready to go into Brisbane to see some more sights. Cassie shook her head and laughed at herself. “I’m going back out to work on my tan!” Connie had one foot out the door. To her sister, Connie scrunched her face; to Alyssa, she winked. Connie returned from upstairs within minutes in her version of an itsy-bitsy teeny-weeny yellow polka dot bikini. The neon yellow set off her ice blue eyes, and contrasted vividly with her ebony black hair. She held in her hand her Hawaiian Tropic, SPF 15. Cassie just shook her head, and opened another Foster’s. Cassie joined her sister, and Alyssa, but came inside after an hour. Even with SPF 40, she was afraid of getting burned. And that was something she never wanted to experience again. She had suffered second degree sunburn and mild sun poisoning when she was twenty years old. Her fever had spiked to 102° and she had violent shakes and chills. Carlotta had nursed her through the night, keeping her hydrated, and plastering her blisters with aloe vera. Cassie shook at the memory. Alyssa joined her for some liquid refreshment, and was in the house when the phone rang. It was Marni and Heath, and Marni took the occasion to chastise Cassie – yet again – for schlepping Connie on this preposterous trip. “Merry Christmas to you too, Mom.” Connie bounced in at just that moment and Cassie handed her the phone. Cassie popped open a Foster’s and chugged it down. She would call Stewart when Connie went back out to the water. Cassie was disappointed not to speak to her fiancé on Christmas, but her promised trip to Connie had preceded her engagement. Christmas dinner was a picnic inside a screened tent to ward off mosquitoes. There was a tree in the house, and gifts were exchanged after dinner, per Brown family tradition. Kay and Ed had thought to bring gifts for their house guests. Cassie’s brightly wrapped package was heavy, and to her delight she discovered a volume on the history of Australia, and a smaller one on the Brown family crest. Alyssa and Connie had become pen pals during an international history event when they both were in their teens, and had maintained correspondence. Connie’s gift was small: a promissory note of a shopping spree with Alyssa. Cassie had found a pair of designer sunglasses she knew Connie would love, and tucked them in a Gucci bag, which she also knew Connie would love. But Connie presented her sister no gift. Cassie was chagrinned, but it was Connie. She wasn’t surprised. Disappointed, but not surprised. Alyssa and Cassie were clearing up the last of dinner, the family watching Christmas movies on the telly. As maternal as Cassie felt toward Connie, she tried to dismiss this as vacation time. But they were guests with this family, and Cassie promised herself she would say something to her younger sister later about not helping out. She wasn’t even in the den with the others. Connie stepped into the kitchen and grabbed her sister’s hand. “I’ve a surprise for you,” she squealed. “Drat! You guessed!” But Connie put her hand over Cassie’s eyes and led her to the den. Puzzled, Cassie heard no sound the telly was muted. Connie positioned Cassie just so, and moved her hand. “Stewart!” Cassie squealed and they were lip-locked in a heartbeat. Connie giggled, quite pleased with herself for pulling it off and not spilling the beans before he arrived. Cassie pulled herself from Stew’s embrace and hugged her sister tight. Cassie’s ice blue eyes sparkled; Connie’s eyes matched. The others turned in for the night, Cassie fanned herself from the evening humidity, warding off attack mosquitoes. But with Stew by her side, Cassie hardly noticed either the humidity or the airborne pests. They watched a thunder storm somewhere far out at sea, waiting for it to turn their direction, felt the first pre-eminent raindrops. Cassie was content, relaxed. It was the perfect vacation. Kay and Ed had commissioned her to paint a family portrait, a bonus to continue her career. She had visited museums with Alyssa, and had plans to visit an Aboriginal Tribe gallery with Kay and Jules, Alyssa and Connie. And now, Stew was by her side til the New Year. Connie padded down now, sheepish. “Pssst, Cass,” she motioned through the gauzy curtains. 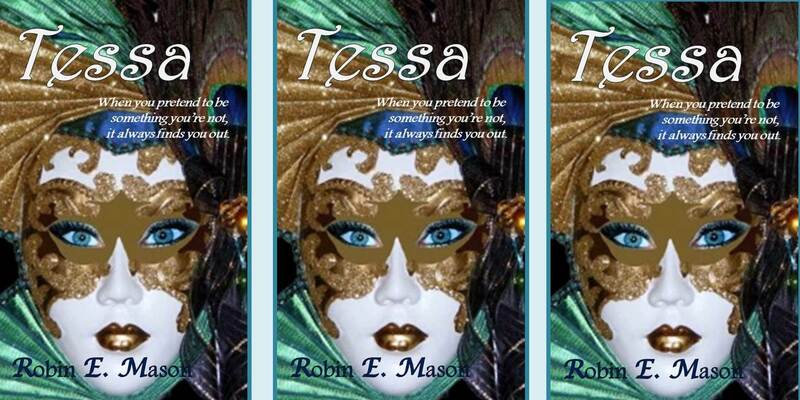 For Christmas, I am giving a copy of TESSA to three lucky winners! Hop over to GOODREADS and enter the giveaway. The GIVEAWAY starts today and runs through Christmas Eve. Winners will be selected on Christmas Day! “Vandy and Marni’s little flat was floating in pink and yellow balloons. Lucius’ cake was a wonder in pink and yellow. The gift table was piled high. Cassie had quite the merry band of “aunts” and “uncles” present for her big day. Vandy, of course, and Scoop, Worley and Hobbit. Tru had moved in with the girls and was a like a third mom to Cassie. Reid, and Apollo and Ermelle and their kids – all made for a lively houseful. Kase even brought a present, a porcelain carousel pony that played Brahm’s lullaby. “Happy Birthday Dear Cassie, Happy Birthday to You!” The familiar chorus rang in the small apartment. Vandy held Cassie and helped her blow out the single yellow candle. At the chorus of cheers and clapping of hands, Cassie waved her arms and squealed and shrieked. Vandy wedged her in the high chair, and Cassie banged her hands on the tray, squealing still. Ermelle deftly sliced the cake- it was a work of art – and placed a generous portion in front of the birthday girl. In the room, behind the closed door, Marni tried to tune out the festivities and celebration of her child’s first birthday party. Cassie poked a tentative finger into the yellow sugar daisies, then two fingers. She drew her hand to her mouth and tasted. “Nummm,” she cooed.” She grabbed at the hunk of cake, shoved a fistful face-ward, smearing pink frosting into her raven hair. Then, both hands got in on the business of consuming the cake. Cassie had an audience, admiring fans, cheering her on, laughing as she demolished the sugar concoction. She giggled and squealed. And plopped her face straight in the remaining cake. Pink and yellow globbed her dimpled nose, her eyelashes, her cheeks. Vandy stepped to the bedroom door, knocked, and peeped in. But Marni just shook her head, and drew her brush in a sweeping stroke across her canvas. It was the most disjointed painting Vandy had ever seen Marni produce. Tru sat cross-legged on the floor, Indian style, holding Cassie in her lap. Vandy handed her a brightly wrapped package. Cassie banged it like a drum. Vandy slipped a finger beneath a flap of paper, popped the tape loose. Cassie grasped the loosened paper and pulled. The paper ripped. Cassie squealed with delight. She pulled some more, more paper ripped, she squealed louder. The wounded paper revealed a Patch Pony®, and Tru let go of Cassie to show her how to pull the toy. His little head wobbled and bobbled and Cassie giggled with glee, bobbin her head to match the pony. Cassie grew weary of the dolly, and spying more gift packages, lunged for the pile. One by one, Tru and Vandy assisted in opening the gifts, and one by one Cassie paraded them before her guests, who cooed and admired accordingly. Kase presented his gift to her last, personally. He had not placed it in the pile with the others; he had not been decided he would join the party. But Cassie had him wrapped around her little finger, and he knew he couldn’t miss her big day. Kase plopped on the floor, playing the carousel for Cassie over and over again. It was her favorite gift. Cassie climbed on his back and begged for pony rides, which he happily obliged. The others were speechless. To see Kase so interactive, so downright playful was a side of him they had never seen, a side he had never let them see. Kase plowed through the discarded birthday gift wrap, sending it sailing in the air. Cassie tumbled from his back and squealed with delight, her chubby legs toddling to catch every piece and ribbon and bow. “Cassie!” Trudy called. “Come see Auntie Tru!” The teen-age girl was enamored of the toddler, and couldn’t wait to have babies of her own. But Cassie would have none of it. She grew sleepy; it had been a busy afternoon, and she fought sleep with greater bursts of fading energy. Cassie escaped Tru’s attempt to hold her, racing, toddler-wise across the room, headlong for the Christmas tree. She barreled right into the lower branches, the silver wire limb poking her in the belly. Cassie was not wounded, however, but tickled. Her shriek of delight turned to terror, though, as the little tree toppled over onto her head. Kase rescued her, rocked her and cooed her. Cassie’s fat little thumb went straight to her mouth, and her plea for her new “Baby” was garbled. Kase sat in a kitchen chair, set the carousel lullaby to play, and rocked Cassie to sleep, a strand of tinsel twisted in her glossy black hair. It was the best Christmas present Cassie could ever get, a baby sister. But it was the worst Christmas morning ever. Santa didn’t come, and she didn’t get to open her presents; the tree lights weren’t even lit. Instead she had cold eggs and burnt toast while Mrs. Dudek read the paper. Cassie took a bath and put on her plaid taffeta Christmas dress. She hated that dress; it was frilly, and Cassie was not a frilly girly-girl. Plus, it was itchy. It was exciting, Cassie had to admit, to have a real live baby for Christmas, even though they wouldn’t let her hold it or change its clothes. She got to look at it through a window to the hospital nursery where there were half a dozen other babies. Heath – Daddy – held her so she could see better. Their baby was swaddled in a pink blanket which meant it was a girl. Cassie was happy she had a sister. She didn’t think she would like having a brother; they peed on everything. Donna had told Cassie this, and Donna had two little brothers so she knew. She played the variations as they walked back to Marni’s private room. “But I wanna hold the baby,” Cassie whimpered. Cassie was sure that meant she wouldn’t be coming back to the hospital, and that the next time she saw the baby would be at home. Cassie folded her arms across her chest and pouted. “Cass, put your coat on so we can go.” Heath was fatigued from pacing the waiting room for five hours. Marni slept off the effect of her epidural; he had yet to be afforded the luxury. But Cassie flopped in the chair by the window. Marni mumbled, her eyes fluttered. Cassie slid her arms into her red pleated coat with the faux fur collar and pulled on her black Cossack hat and mittens. She started for the door, and turned to kiss her mother on the cheek. “Did you see your sister?” Marni tried, she really did, to engage with her elder daughter. “Yeah, I saw her. She’s cute.” She waved at Mommie as she turned toward the door, her gaze on the floor.